Exclusive Reciprocal Golf Program Expanded benefits for Norton Country Club Single and Couple Golf Members. 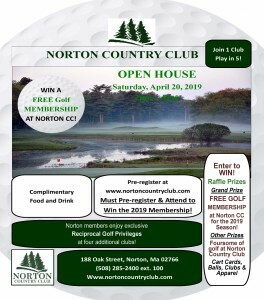 Norton CC is participating in an Exclusive Reciprocal Golf Program providing golf privileges for Norton Country Club Single and Couple Golf Members at four area Golf and Country Clubs. Members must make their reservations through the Golf Pro at Norton Country Club up to 7 days in advance. Cart fees and nominal greens fees apply and play is subject to course availability.